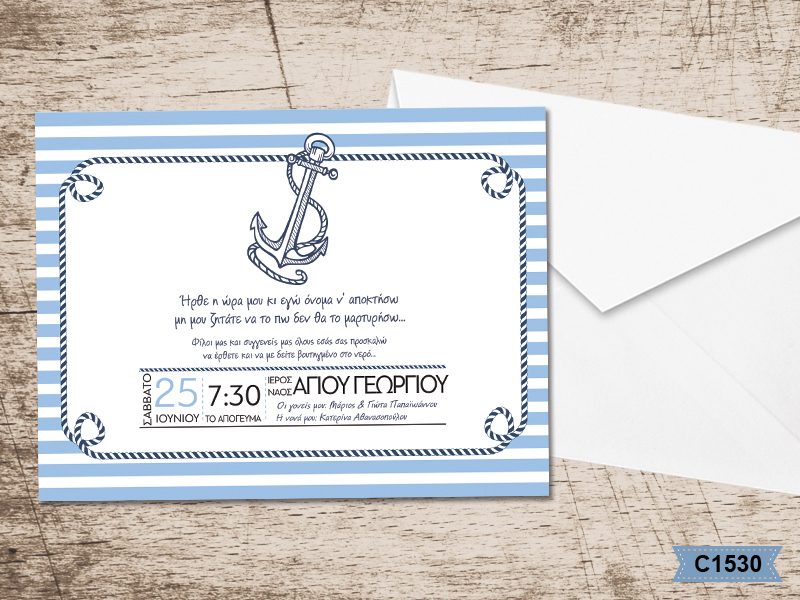 Beautiful nautical themed Greek Orthodox Baptism invitations for your baby boy. This summer invitation is coming in a board with an anchor and navy cord pattern and stripes in baby blue and white colour. The matching envelopes are white classic paper and your personalised wording is printed in plain blue colour. https://www.preciousandpretty.com/2017/05/nautical-themed-greek-christening-invitations-C1530.html Greek Wedding Favors|Orthodox Crowns|Stefana|Baptism Invitations Nautical themed Greek Christening invitations C1530 Greek Christening invitations with nautical theme for boys. Product #: Greek Wedding Favors|Orthodox Crowns|Stefana|Baptism Invitations_876514596549077471 5 stars out of 5 reviews.